Today AMD is filling out the middle of the FirePro line with their new W4300 GPU. 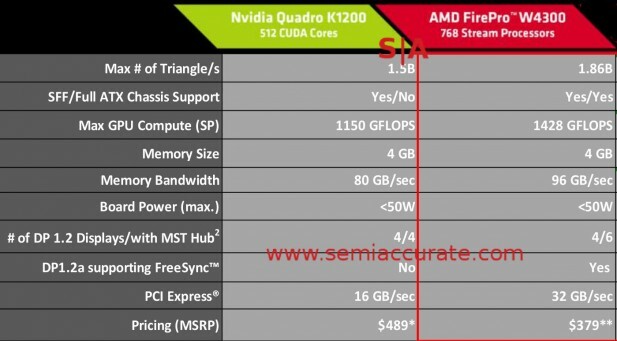 While SemiAccurate thinks it is not a game-changer, this new card is at least the high-end of the low-profile professional GPU world. Imagine taking a Bonaire Pro GPU, the same one as found in the bigger W5100 FirePro card, and put it on a low-profile PCB. Then you set AMD’s PowerTune firmware to a 50W cap, and that gets you a W4300. From a logical point of view this should hamper the performance of the baby card quite a bit but the paper specs are right on top of the bigger W5100. In the real world there should be some peak performance differences mainly surrounding how long the 50W device can stay at the highest clocks. While we don’t have comprehensive benchmarks for both cards yet, we don’t think the difference will be very pronounced for most use cases..